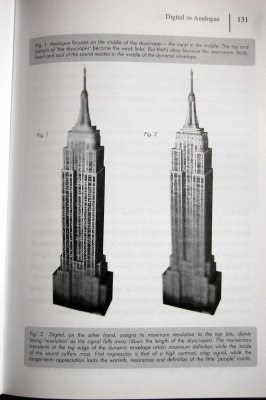 "By way of analogy, I'd like to compare the recording dynamics with photographing a large skyscraper. As you can imagine, due to its enormous height it's difficult to capture the entire building in perfect focus. Here's where Analogue and Digital technology differ, by limiting our focus to distinctly different areas of the building." A mate of mine made the case that this is also true of digital photography and, although I can't remember all the argument, I can see how it works in that the brightest and darkest areas of the image become the peaks in the dynamic range of colours. The author of this Audio Technology column, Michael Stavrou, recommends putting a limiter ahead of a compressor in the signal path on those occasions when you're worried about clipping the signal. I thought the diagram showed the benefit as clearly as the article but I should add that Stav's writing is always excellent. If he keeps writing columns like this, he'll have a follow-up for the book Mixing With Your Mind out soon. Top book. 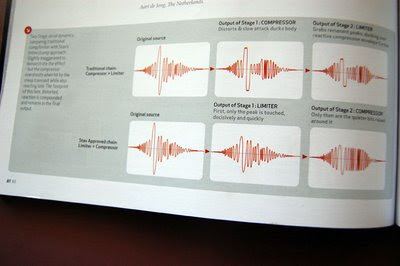 This short video shows the instruments used in the track Doublecrossed, which can be heard in the player in the right-hand column. More about the aeolian harp here and directions for making wind organs can be read here.